Download 5 times faster any Internet file or document with Internet Download Manager, a smart choice for the users that are frequently doing this operation. 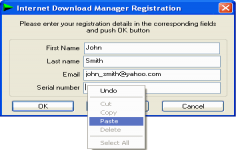 Internet Download Manager is a software that allows to manage the downloads made from the Internet in an efficient and timely manner. Saving videos, applications, music less time is now possible with Internet Download Manager which has a download speed 5 times more powerful than average. It supports all data types with the possibility to be an application, text, video or an image. The application informs the user about the size, file type, and location. In case the user can not follow the download to finish, he can pause and resume a more convenient time so as not to damage the file to save. Thus, user can run multiple downloads and better manage their completion. Internet Download Manager can shut down the computer once completed downloads. The software is compatible with most browsers, having a manager and a planner of users list of downloads. Curently we don't have any log information about Internet Download Manager version 6.32 Build 7 for PC Windows. We will this change log update soon!